KANSAS CITY, Mo. 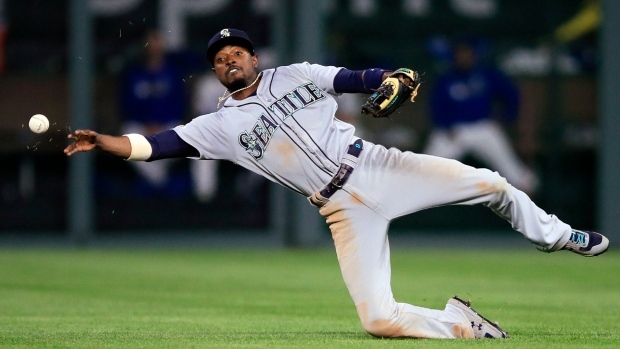 — Dee Gordon helped Seattle with his bat and his glove. The Mariners are rolling along quite nicely at the moment. Gordon got three hits and drove in two runs as high-scoring Seattle extended baseball's best record with a 6-3 victory over the Kansas City Royals on Tuesday night. Jay Bruce hit his AL-leading seventh homer in the first inning, extending the Mariners' string to 13 games at the start of the season with at least one home run, matching the Detroit Tigers in 2017. The 2002 Cleveland Indians (14 games) are the only team since 1908 to open the season with more games with home runs. Seattle also matched the 2000 St. Louis Cardinals with the most home runs (33) through their first 13 games. "Our lineup, top to bottom, has been really good," manager Scott Servais said. "We had the one home run early, and I say 'just one home run' because we're used to more. We were able to tack on some runs late which was really helpful." Gordon singled and scored on Bruce's grounder in the third. He hit a tiebreaking two-run single in the fourth and singled again in the sixth. Gordon also made a couple of nice plays in the field. He said he is happy to be spending more time at second base after playing four different positions last season. "I like playing second base," he said. "That's my job. We're not always going to score a bunch of runs. We're going to have some real close contests and you've got to play defence." Kansas City manager Ned Yost said Gordon was the difference for Seattle. "Four times we had opportunities there that were just right there," he said. "All four, Dee Gordon. We just hit them right to where he could just barely get enough reach on them." "There's a lot of genuine happiness and joy for me, which was special to share that moment with these guys," Merrifield said. "But, it's special to do something that one of the greatest of all time has done. My eye's not on George's record. We've got more games to go." Speedy Billy Hamilton scored from second base on a sacrifice fly when Seattle's Mallex Smith fell down in deep centre catching Adalberto Mondesi's drive, making it 2-all in the third. Jakob Junis (1-1) allowed four runs in four innings. Richard Lovelady, the Royals' fourth pitcher, tossed a perfect eighth inning in his major league debut. Mariners: INF Tim Beckham remained out of the starting lineup with tightness in his right hamstring. He tweaked it in the Mariners' 12-5 victory over the White Sox on Sunday. Servais said the decision to hold out Beckham was by the training staff. "Beckham feels better today," he said. "He could probably go out there and start the ballgame tonight." Royals: LHPs Danny Duffy and Brian Flynn remain on the 10-day injured list with arm issues. Yost said they're "doing fine" in their rehabs but wouldn't elaborate further. The Mariners placed right-hander Chasen Bradford was placed on the 10-day IL with shoulder inflammation. "We've used him a lot early," Servais said. "He's kind of our go-to guy. You know what you're going to get when Chasen goes out there. He's been very effective. We got a couple of innings out of him last night. He came in after the game and said he felt a little sore, tight." He was replaced on the roster by right-hander Erik Swanson, who is looking for his major league debut. The Royals promoted right-hander Heath Fillmyer and Lovelady from Triple-A Omaha. Right-hander Kevin McCarthy and lefty Tim Hill were optioned to Omaha. Mariners: LHP Yusei Kikuchi (0-0, 4.02 ERA) will get the start in the second game of the four-game series. Royals: Fillmyer will make his 2019 debut for the Royals.